The home secretary has appeared to rule out the possibility of Scotland being handed powers over immigration after the UK leaves the EU. Amber Rudd said introducing different rules "would complicate the immigration system, harming its integrity" and cause problems for businesses. SNP MP Tommy Sheppard accused Ms Rudd of showing arrogance and complacency. There have been calls in recent weeks for the UK government to allow Scotland to set its own immigration targets. And Michael Gove, a key figure in the Leave campaign, suggested ahead of last June's EU referendum that it would be "for Scotland to decide" on immigration numbers to the country after Brexit. 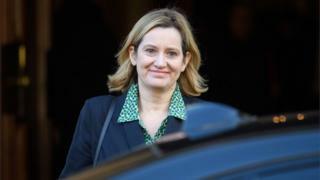 But speaking in the House of Commons on Monday, Ms Rudd said the government's immigration policy "works for the whole of the United Kingdom and that's the one we will continue to support". She added: "Immigration remains a reserved matter and we will consider the needs of the UK as a whole. "Applying different immigration rules to different parts of the UK would complicate the immigration system, harming its integrity and cause difficulties for employers who need the flexibility to deploy their staff over the UK." Mr Sheppard, the SNP MP for Edinburgh East, condemned the stance taken by the home secretary as he said other countries operate regional immigration policies. He said during Home Office questions: "That is a very disappointing response infused with both arrogance and complacency. "There are many large countries such as Canada and Australia which have regional variations in their immigration and visa policies to take account of diverse and complicated local economic circumstances. "Is it not foolhardy for this government at this very early stage to rule out the prospect of doing that in the regions and nations of the United Kingdom?" Fellow SNP MP John Nicolson also pushed Ms Rudd to allow Holyrood to set its own targets. But the home secretary hit back by suggesting the Scottish government would be able to attract more immigrants if it improved its health and education services. She said: "You must share my view surely that Scotland has sufficient powers, has its own powers to do many things it could do, perhaps to improve its education system, perhaps to improve its health system. "Immigrants will come to a place where they see an improving education system, an improving health system and perhaps the SNP should spend a little bit more time on applying itself to those important issues rather than constitutional ones."